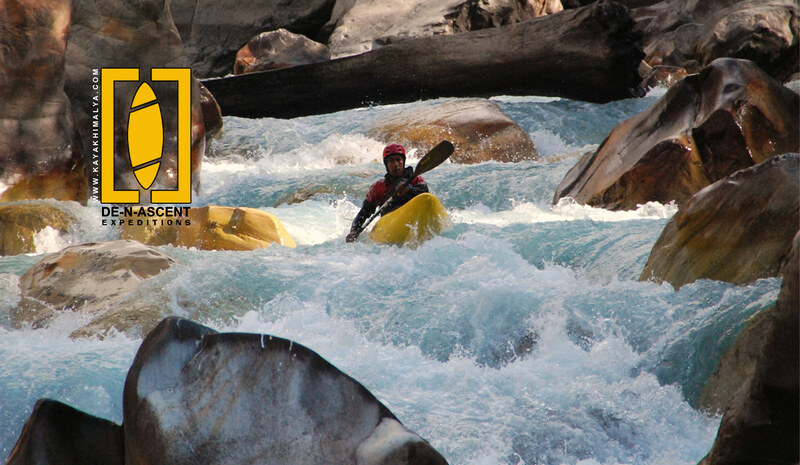 Experience the thrills of White Water River running, we do provide wetsuits and waterproofs, to help keep you warm. Because of the great location of Himalaya, we have easy access to classic white water kayak runs, giving us the flexibility to choose a river that suits the individual groups requirements. Shivpuri has become one of the most busy rafting put in and take out point in the world, no wonder it has so much to offer to white water enthusiasts from the level of excitement to a safe ride down the river. Once you get set to go with rafting gear and safety instructions you straight away riding the big splashy waves of the first rapid called Return to Sender and as you go down the river around the corner you hear the sound of the longest rapid of Ganga Roller Coaster, a massive breaking wave in the beginning and the trial follows all the way to the bottom. You are yet not close to the biggest rapid of the section the Golf Course, for the first timers its like no clue just riding a cloud, all you see is white water, and rest of the section is grade II of splash and jumps, ideal for floating and cliff jumps. Our timings are normally fixed for Shivpuri trip but we could arrange timings for the big groups. 8.30am/ 2pm you come to our office or We can do a pick up if you staying in a Hotel in Rishikesh and we bring you to our base where you get dressed, we provide changing room and rest rooms, then we drive to Put in and finish point we bring you back to base then you get changed and you will get dropped back in the hotel or our office. Marine drive trip is one of the most selling trip on the Ganga, its not too short neither too long, we make a short break at Shivpuri for drinks and snack and a short break at cliff jump where you can try jumping from a 5 mt cliff into a very deep water. Koudiyala is known as upper section of the river, it has two big rapids up stream Marine drive and rest of the stretch is the same. This trip we start early at 8:00 am from our base, we get change and drive to put in, after floating an hour we reach to the The wall and we stop above the rapid for a quick scout and set up the rescue kayaks at the bottom then we run down, its a potential flipper rapid but very safe to flip because the flipper hole is in the end of the rapid and a long flat section makes safety kayaker's job very easy to collect all the swimmers. We keep floating down the river and later around mid day we make a lunch break and enjoy the meal from the famous restaurant Chotiwala in Rishikesh. After a long day on the river we reach to the final point NIM beach and drive to base 5 minutes, then you get changed and drive back to hotel.